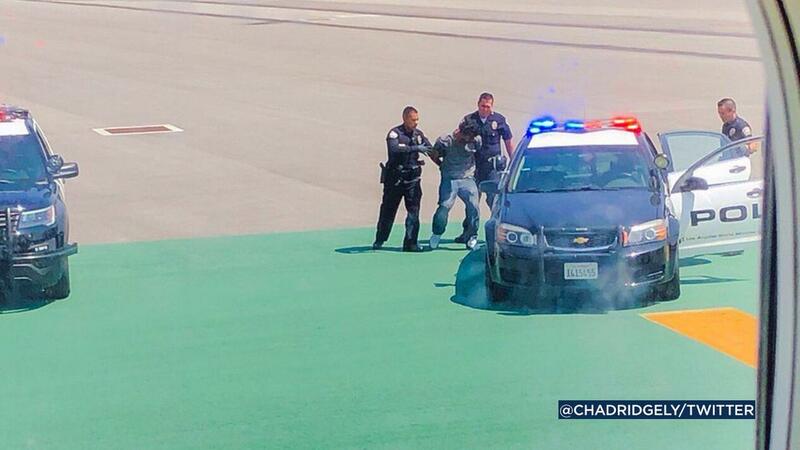 Los Angeles airport police arrested a man after climbing a fence and approaching a Delta plane, officials said. Officers discovered the man climbing the fence and detaining him as he got closer to a Delta plane seemed that was scheduled for departure. A passenger on the Delta flight said it looked like the man was doing push-ups before being arrested. "He's under the plane, he jumped up and tried to touch the wings, he ran to the other side of The plane touched the engines, he got on the ground and started doing some push-ups This time, police and security came to him, "said Tom Ruffing. The police later identified the man as Luis Aguilar, 23, of Los Angeles. The police said Aguilar seems to be a transient with mental health problems. Aguilar was booked for trespassing. He will receive a psychological examination if he is released by the police.